Drivers descended on the quarter-mile "Thunder Ring" on a warm dry Thursday night looking to get in position to make a run for a championship in week 9 action of Thursday Thunder presented by Papa John's Pizza. In addition to Week 9 action, Bandolero drivers made up Week 7 and Week 8 action that was postponed due to rain. Week nine action in three legends divisions did not take any of the uncertainty out of the points battles for a championship. The VP Racing Fuels Pro Division saw the biggest swing among the leaders and continues to prove the race remains wide open. While Dawson Fletcher of Canton didn't find victory lane in the Pro Feature, he posted the best second place finish of the season and swung the points race in his favor. Entering week nine action, Fletcher trailed Cody Hall of Griffin by 11 points for the division lead. He elected to start at the back of the field in 11th and made his way through the pack to finish in second behind Jensen Jorgensen of Stockbridge. 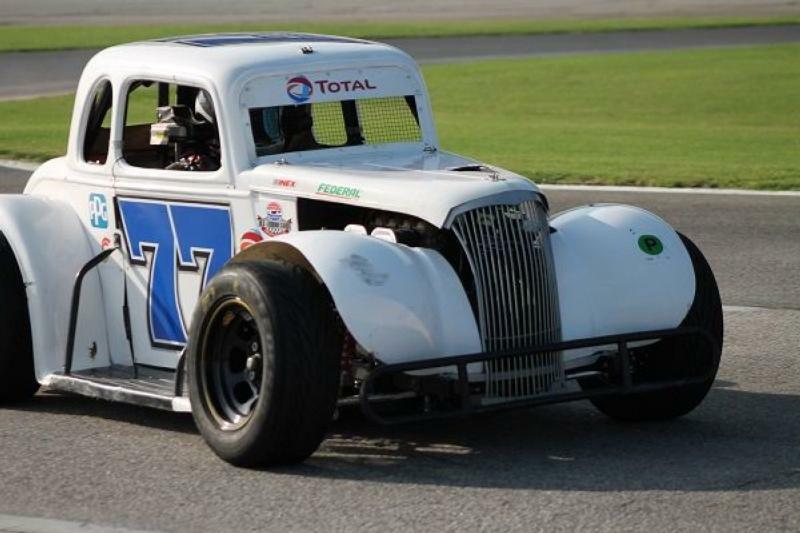 "I did see the 77 on my bumper and I felt him a few times giving me a push down the straightaway," said Jorgensen. "I was ready for him to bump me in turns three and four and he gave me a nudge but knew what to do to not get knocked out of the way for the win." While Fletcher finished second in the feature and collected nine passing points for a total of 106 on the night, Hall struggled as he was collected in a pair of cautions and couldn't make up any ground finishing sixth after starting in the seventh position. After the drops, Fletcher now leads the Pro division by five points heading into championship night. While the door is open for a handful of competitors in the VP Racing Fuels Pro Division, it's even tighter in the Masters Division between Bill Plemons Jr. of Locust Grove and Robbie Woodall of Stockbridge. The pair entered week nine action in a dead heat in the points standings while each has the same number of wins and second place finishes. The on track action didn't disappoint as Woodall started on the pole and held off Plemons for the win. The oldest winner in Thursday Thunder history, Plemons got to the back bumper of Woodall numerous times throughout the race but couldn't find a lane around. "I hope we can do this again next week. The way the points work, it's all going to come down to next week either way. Next week is THE week," said Woodall following the win. "I just had to shut the door on Plemons tonight. We were coming down to the end and he was right there. I have no idea how I'm gonna grab the win next week. We've been working really hard on the car so we'll go back and go over everything, do it one more time and hope for a little good luck and see what happens. Hopefully we can get it done." With the pair within one position of each other and almost identical records, it will come down to a winner take all between Woodall and Plemson on Championship night in the Masters division. Ryan Rackley of Valdosta and Lawson Ingold of Social Circle finished 1-2 in the Associate Group Young Lions Division feature and remain 1-2 in the points standings after week nine. Rackley earned the pole and beat Austin MacDonald of Pictou, NE to the inside of turn 1 to take the lead off the drop of the green flag. Rackley methodically clicked off the laps in the lead while Ingold battled Audrie Ruark of Suwanee for third. A caution with two laps to go bunched up the field and allowed Ingold to get by MacDonald on the inside and the pair headed into turn one on the final lap to finish second. It was the bandoleros who took to the track to open the evening's activities with their pair of make-up feature races immediately before and after the autograph session. The Bandits Division rolled off the grid first and Carson Ruark of Suwanee only needed two laps to get to the lead after starting on the outside pole in the Week 7 make up feature. Ruark crossed over Grant Thompson of Mobile, AL on the front stretch and dove into turn one and made the pass stick exiting onto the back stretch out of turn two. After a caution on lap 6, Ruark extended his lead over the field over the final nine laps to earn the checkered flag. Thompson finished second while Carter Griffis of Homerville found the podium in third. Ruark struggled in the second make-up race as he finished fourth after starting on the outside pole. Thompson started on the pole and led all 15 laps to post his first win of the season. Thompson survived four cautions including a pair of consecutive yellow flags before the field completed the first lap. Ruark got collected in the second of the two opening lap cautions and was mired in the back of the pack for the remainder of the race. Kelley Puckett of McDonough earned a second place finish while Ryan Younginer finished third. Ruark redeemed himself in the final Bandits race of the night as he dominated week nine action and earned his fifth feature victory of the season. Ruark and Thompson battled door-to-door for the lead over the first two laps. Ruark was pulled away and posted the victory by more than two and a half seconds over second place Thompson. Blaise Maddox added to his points lead with his fifth consecutive win in the GRT Racing Driver Development Outlaws division in the first of three Outlaws feature races of the night. Maddox started on the inside of the second row and took three laps to get to the lead. The field could not use a pair of restarts to get past Maddox who held off a hard charging Kenneth Henderson of Alto and Kenny Brady of Marietta for the win. The second make of feature for the GRT Racing Driver Development Outlaws saw Joshua Hicks of Senoia lead from flag to flag to post the victory. Hicks, who was the 2017 Thursday Thunder presented by Papa John's Pizza Outlaws division champion, used a battle for second between Maddox, Henderson and Brady to pull away from the field and cruise to the victory. Maddox had the advantage and finished second ahead of Brady in third. Week nine action in the GRT Racing Driver Development Outlaws closed out the night's racing action with Maddox collecting his second feature win of the night. Maddox started on the outside pole, but did not take the lead until lap six. He used a caution and battled for two laps door-to-door with Brady before out racing him for the lead from the outside lane. Beginner Bandoleros opened the week nine action and Clay Hocutt of Mobile, AL used a caution with seven laps to go to take the lead in the first feature of the night. Hocutt outgunned Nathaniel Harry of Concord, NC and Kyle Bacon of Mariette over the final seven laps for the win. In the second beginner bandolero feature of the night, Hocutt and Bacon collided exiting turn four on the final lap allowing Lee Brown of Acworth to come around the crash and picked up the win. The first legends action of the night saw Davis Rochester of Lebanon, TN take a commanding lead into championship night in the Semi-Pro division after he collected his third win of the season. Rochester moved up to second by the third lap and then aggressively beat on the back bumper of Jay Coen of Dacula for the lead. Rochester finally made his move on Coen on the backstretch of lap seven. He slipped to the inside and powered down the back stretch. DJ Canipe of Fallston, NC used the opening created by Rochester to move to second. Caution free until the final lap, Rochester drove away from the field and could not be caught over the remaining 13 laps. The Thursday Thunder Legends Series presented by Papa John's Pizza concludes with Championship night with a special Saturay night event on August 4th.